Drew Angerer/Getty ImagesAdult-film actress Stormy Daniels and her attorney, Michael Avenatti. Daniels also said Avenatti ignored her monthslong requests for accounting information on crowdfunding for her legal fees and launched another campaign “to raise money on my behalf,” without her knowing. Avenatti released his own statement saying he was Daniels’ “biggest champion” and had “personally sacrificed an enormous amount of money, time and energy” for her case. Daniels suggested she was still considering whether to keep Avenatti as her attorney. After Avenatti was arrested on suspicion of felony domestic abuse earlier in November, Daniels said she would be “seeking new representation” if the allegations were proven to be true. 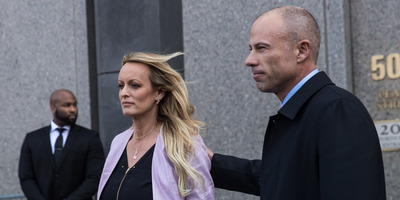 “But in other ways Michael has not treated me with the respect and deference an attorney should show to a client,” Daniels added. In response to Daniels’ claims, Avenatti released his own statement to The Beast. The attorney asserted he was Daniels’ “biggest champion” and had “personally sacrificed an enormous amount of money, time and energy” for her case. “We reset the page as the focus of the case changed from when we first launched the site,” Avenatti said to The Beast. Avenatti, who asserted he had not “received a dime in attorney’s fees” through the crowdsource campaign, added in another email that Daniels’ “extraordinary” fees amounted to hundreds of thousands of dollars “due to the high level of death threats” and “out-of-pocket costs” for litigation. In her lawsuit against Trump, Daniels said he had defamed her by suggesting she had lied about an alleged relationship with him. A federal judge eventually ruled in favour of Trump and ordered Daniels to pay for his legal fees. Avenatti said he would appeal the case. Avenatti and Daniels became household names after she said she and Trump had an affair in 2006. Trump has vehemently denied the allegation. Michael Cohen, Trump’s former personal attorney, said he arranged a $US130,000 hush payment to squash the story in order to protect Trump’s 2016 presidential campaign.